Our surf life saving clubs are filled with volunteers who do for others, year in and year out, from season to season. Louise Lindop, who many would have seen on water safety duty at Lion Island Challenges, or on the beach training people in all aspects of what is needed to get a Bronze Medallion, is a dedicated Chief Instructor at Avalon Beach SLSC, one of the key positions of any surf club, and a role held for five years of her 14 years as a member of this club. In 2009 Louise was awarded the Sydney Northern Beaches Life Saver of the Year, the same year husband Charles won an Award of Courage for his rescue of son Andrew from a shark attack. In the 2011/2012 Season Avalon Beach SLSC Club awards the Norman Cook Club Member of the Year recognised Louise's contribution to her club, and in the same year she became the recipient of the Harry Ragan Award for Outstanding Service in the Sydney Northern Beaches Branch awards. When you read many of our local club's annual reports 'thanks to Louise Lindop' - for training and proficiency - appears, showing the breadth of her Branch role of helping other clubs. Louise doesn't consider herself a role model or inspiration for younger women, but she is. When training people or part of the water safety crews for Avalon Beach SLSC water events she is serious, but that smile quickly comes out afterwards - a warm, sunny face makes you smile just being around her. ‘I’m not a thinker – I’m a doer – I like getting things done’ the lady answered when asked an introspective question - this week we get to share a small insight on what she has done and continues to get done. At Manly Hospital on the 17th of March, 1965. I grew up in Forestville and Beacon Hill – mainly Beacon Hill. This was a pretty suburban area, more of a younger suburban than it is now I suppose. When we were kids we went to Freshie Beach (Freshwater), every weekend and grew up on the beach. We weren’t involved with the Surf Club interestingly enough, in view of all our involvement now. My grandfather was a member of Dee Why Surf Club many years ago but it skipped our generation, my parents weren't so keen on Nippers. I started off at French’s Forest Primary but moved to Beacon Hill Primary in year 2 and then went to Beacon Hill High. There was 18 months when my parents pulled us out at ages 11,12 and 13 and off we went travelling the world for 18 months. We took our school books with us, lived in my Dad's home town, Sunderland, for a few months and travelled Europe - five of us packed into a car with my brothers and I carrying on in the back seat - if you can imagine! Did you go on to Uni? No I did not, I hated school. I left when I was 15, finished Year 10, not because I didn’t do well but because I didn’t like it. I was impatient to get out and do something. I worked at McDonald's first off and at that time I wanted to be a McDonald’s manager, at 15 years of age. Mum and dad said ‘you can’t leave school and work at McDonald's, you have to get some kind of qualification’ so I went to Williams Business College which was above Sandy’s Music on the main road at Dee Why. There I learnt how to type and do shorthand... then I went to work at McDonald’s full time. I was there until just before I turned 18. You couldn’t be a Manager until you were 18 – so I was doing the job of a Manager, but wasn't an actual Manager. They were probably taking advantage of me to a certain extent – the store Manager or Franchisee would sit in the back doing his paperwork while I was running the show and the shift – I did the rostering for 120 staff at the age of 17 and used to run shifts, boss people around and held every record in the store - the most amount of money through a till in an hour, Outstanding Crew Member of the Year, Employee of the Month, I couldn’t get enough. I loved it, the whole social aspect of it with all the staff. The store opened when I went there at 15, so we were the original crew, 120 15 year olds – so there was instant friendships that were pretty solid for a number of years. But when I was about to turn 18 and become a true Manager I decided it wasn’t really what I wanted to do and I'd had enough. What did you move on to? I became a Legal Secretary at Northbridge. I then took another job for three fellows that worked for a computer company that was Burroughs and became Unisys around that time. They didn’t really need a secretary but felt they were of a status that deserved one – and so employed 19 year old Louise. But they didn’t really have much work for me to do. They happened to be in the same building as The Education Team, who were completely run off their feet as the office automation era took off. These were the days when everyone was throwing out their electric typewriters and getting desktop computers. So every single secretary had to learn Word Processing, Spreadsheets, all those office automation products that nobody had ever heard of and nobody knew how to use. Because I had little to do the I went on every course that they ran and then once I’d done the courses they were desperate for people to teach them and so would say to these three Programmer fellows ‘can Louise come and teach this course for us?’ and that’s how I got into Training which I’m still in today. – That was my fall into a career that I'd never planned. I enjoy it though. What’s the best aspect of training people? With the training I do now, the face to face training is mainly within the Surf Club, which is quite satisfying because the people we’re training want to be there – they’re getting a lot out of it, getting fitter and learning new skills. Career wise at present it’s mainly Online Training, which is a little bit drier – this can range from Work Health and Safety training for 5000 employees to teaching healthcare workers how to resuscitate a baby - it's all about staying compliant and communicating change. The Online Training I fell into almost 20 years ago when I joined a local company. Now it just happens to be an industry where everybody needs it, it’s one of those growth industries. We’ve done a lot of work with in the Corporate market and the Health sector – there are endless numbers of Programs they want placed Online. How did you get involved with Avalon Beach SLSC? When Sarah was in Under 6 Nippers somebody of course says ‘why don’t you do your Bronze?’ – so we did. Charles and I did it together in 2000. Well, the kids came and went from Nippers, but of course people realise that you have training skills and so it’s ‘do you want to come help train’ and this becomes ‘do you want to be Chief Instructor?’ so you go from one thing to the other and suddenly you’re putting in 20 hours a week. People who are close to you Louise, and from what we’ve seen for years too, is that you’re passionate about sharing skills and knowledge– is that a flow on from a 15 year old going the distance at McDonald’s? No, it would be more a general enthusiasm for passing on information. People get a bit of a buzz when they come and do their Bronze – they work hard and get assessed and come away with their Bronze Medallion. We’ve just put through a squad of forty-three 15 year olds, and that’s our biggest squad ever of that age but in at the same time there was a fellow who was 70 – so you get people coming along for all sorts of different reasons. Some of them are doing it because their parents told them to, some because their mates are doing it, some because they’re at mid-life and want to get fit and establish a health regime for going forward. So you get all sorts of people with different motivations. Some people want to compete, row a boat, or drive an IRB, others want to meet local people. Generally they’re positive reasons and they want to be there, so that makes them easier to teach. What’s the best part about of it for you? The community service aspect within the club. Giving people skills they can use in the club, at home and in the broader community. How can Surf Safety be geared so it speaks to all visitors to the beach in terms and a language they understand? One of our patrol captains and Bronze trainers, Stephen Early, actually designed a booklet with all the basic surf safety messages in around 10 different languages. It's great - we have copies of it on site at the surf club. In Avalon, on the average day, we don’t have a big tourist population visiting the beach – visitors tend to go to either Mona Vale or Newport, or if going beyond there, they visit Palm Beach – so patrolling at Avalon is different to patrolling at beaches where they get a heavy influx of people who are non-swimmers or don’t have an English-speaking background. It’s a different vibe for want of a better word at Avalon – for instance, if you came running up to North Avalon every time someone went swimming near the Nth Av rip and started squawking at them through a loudspeaker, you’d be very unpopular. Whereas at North Palm Beach you have to do that on a public holiday. Surf Safety at Avalon means you’re vigilant, you’re watching, and you do tend to be able to pick the people who need watching and speaking to. How many hours would you put in over the Season? At peak times probably 20 hours a week. As well as my work within Avalon Beach SLSC, I do a lot of work within the Sydney Northern Beaches Branch – so I could be assessing at any of the 21 clubs on the Northern Beaches – there are hundreds of people wanting to get their Bronze each season. All year around it averages around 10 hours a week. You are also involved in running courses outside of the season too though? 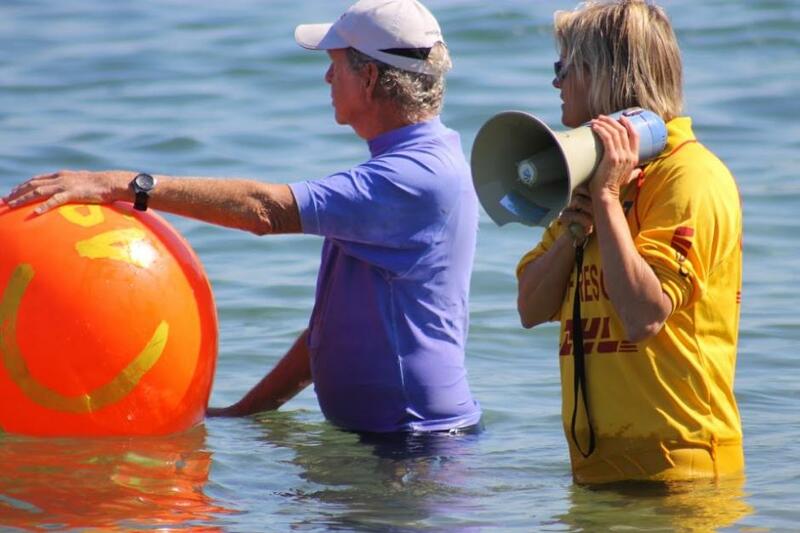 Yes – we run a Winter Bronze Squad; I don’t co-ordinate that, Mike Stanley-Jones does, he’s one of the Bronze trainers within the Avalon Beach SLSC and does a lot of work with the younger members. He initiated the concept of a Winter Bronze Squad. This starts in early May or late April when the season ends. They train for a few months and get their Bronze in late June or early July. As soon as the season closes we have the Awards night, then the Annual Report needs to be done and then once that’s done you have the next Season’s Roster so it’s fairly continuous once you get heavily involved. And the talk to Seniors you did last Spring? That’s part of a Community Awareness on CPR Training we do. Chris Hopton and I gave a talk to the seniors at the Tramshed in Narrabeen a few months ago and I give an annual refresher on resuscitation and defibrillation at my parent's bowling club in Seaforth. In the last couple of years we’ve also done CPR Training at Avalon Primary School and for the Palm Beach Longboarders. This takes around an hour and a half with an aim to teach them to do something rather than nothing while they wait for the ambulance. Training on Avalon Beach - Avalon Beach SLSC picture. Giving people these skills does save lives though? Somewhere down the line it will, yes, if you spread the message wide enough. 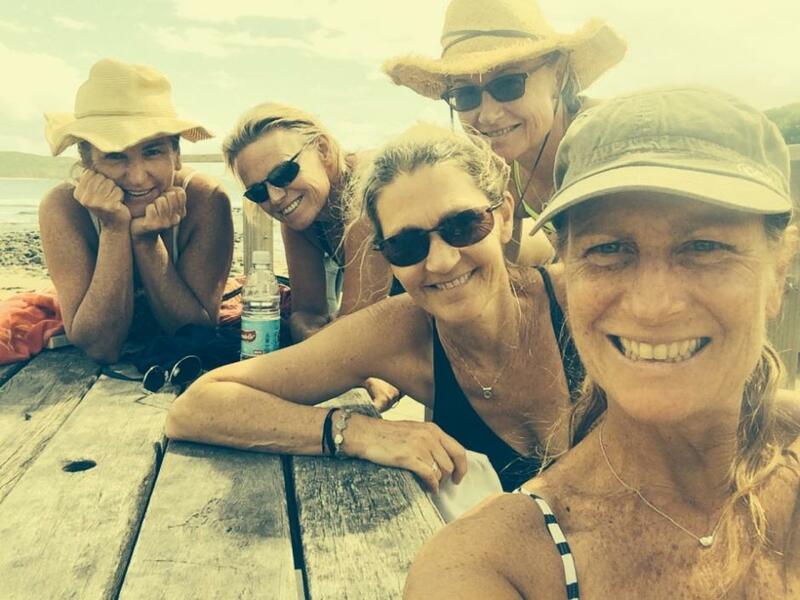 There’s a core group of girls who work well together down at Avalon, we won’t mention the name 'The Duck's, and who seem to do regular trips away together - how did this come about? We all met through having a common interest in the club, most of us patrolled together for five or seven years as Patrol No. 8. I was the Captain of the Patrol and the girls were on it as well as a bunch of blokes. One year we decided ‘let’s go on a holiday’ and it just rolled on from there. We’re off on Saturday for our 4th annual trip to Crescent Head. None of us really knew each other prior to that Patrol, outside of the club, so that’s a very strong friendship group that’s formed within the club. They’re all very positive girls, which is a bit of a key to being happy, surround yourself with positive people. They all have an incredible attitude and just get on with life, they’re great girls. Is Patrol Number 8 still going? Yes – I handed over the captaincy to Steve Broderick this year. We have a pretty strong couple of hundred people that Patrol the beach and I’d been patrolling for 14 years, so I figured my time is better spent training. One of the big jobs at the club is doing the Annual Proficiency – once somebody becomes a lifesaver every year they have to come in and do a run-swim-run, CPR, their Signals, Radios, all of the basics. I co-ordinate all of this – which involves running seven or eight sessions; if you schedule it for one day and then the surf is big you have to cancel it and reschedule it. It can take a while and there’s a fair amount involved. Luckily I have a great team of trainers helping out. What happens if they’re not too strong in any of these? We work with them, spend more time with them on that. Some clubs run it a bit like a test – we tend to run it as a refresher. So if you turn up and you’re twice as rusty as the person next to you, they’ll be going home sooner and you’ll be doing a bit more work. Did you have any challenging experiences while captaining a Patrol? Not particularly, crappy weather would have been the worst. Generally the number of rescues done within patrol hours when I’ve patrolled has been minimal. As a family we’re all surf lifesavers and have been involved in more rescues and incidents outside of patrol hours and outside of Avalon, when on holidays. Charles, Sarah and Andrew all have Gold Medallions, so I'm in good company on holidays. Charles did a very serious rescue up at Treachery Beach about 8 years ago; this is a beach that’s not patrolled at all. A fellow was just drowning basically – he was way out, in a rip, drowning. He’d taken all his clothes off because they were dragging him down – he was about 120 kilos, naked, his wife was screaming from the beach. Charles had actually snapped his board in half and had gone paddling down that way looking for it, saw this woman screaming and pointing from the shore and realised this fellow was out there drowning. By the time Charles got to him he was well and truly going down but he managed to bring him in and he was taken off to hospital, he was ok.
Those types of incidents do occur. You have that awareness, from Patrolling, where you notice stuff other people may not see. I was at Palm Beach one day, getting my board off the roof of my car about 500 metres from the pool. I looked over to the pool and saw this little huddle of people around what looked to be somebody on the ground on the pathway to Palm Beach pool. A lot of people would see that and just get on with their surf whereas I see it and think ‘trouble there’ – and then somebody goes running along the path and I think ‘definitely trouble there’, throw my board on the sand and get up there as quickly as I can. By the time I get there the guy needs resuscitating so that’s what you do. Experiences like that highlight that awareness, but the number of incidents, between the flags when you’re on Patrol are minimal - it's all about prevention. People say why do you do all this stuff with the surf club – and that was a classic situation there. Volker Klemm and Mike Stanley-Jones who I'd spent a lot of time training around that time were at the south end of the beach and they had that same instinct; they saw a little huddle at North Av. And thought ‘that’s not right’. They took a breath, took the time to grab the gear that they might need, and came to the aid of my own son. So when people ask ‘why do you do all this stuff for the surf club’ – I simply point to that one incident, it’s obvious, it comes back around. So that didn’t put you off going in or being around the water? Not really – I took up surfing after that. I learnt to surf, on a stand up paddle board about five years ago. Obviously the first few times you go in the water after something like that you are a bit freaked out, and it’s just that terrible feeling, for the whole community I think, of ‘that’s our playground – that’s where we go to do everything that we love to do as a community here’. So it wouldn’t have been just me feeling like that. He couldn’t wait to get back in (Andrew) – he was out for four months which for him was the worst part of it all - not being able to get in the water and surf. He's a professional lifeguard these days. The whole point of that experience illustrates where it’s not so much just being on patrol, it’s a broader part of your life where you’re getting something back and giving through what we do at the surf club. I say this to the 15 year olds, that you are very unlikely to go running up to somebody in your yellow and red uniform and save their life – But, you kids will be up the North Coast when you’re 17 year olds and on your P plates and something will happen somewhere and you guys will use these skills to save a life, to help people – and it might be one of your mates. They all go ‘ok’. Why did you take up stand up paddle boarding? My husband bought a stand up paddle board. The story began when Andrew was attacked by the shark, and through that we met Bruce Raymond, a big wave surfer and ex-Quiksilver executive, who regularly goes to Hawaii and rents this house on the North Shore in December each year. He’d invite people to share this place. Nine months after Andrew was attacked he said ‘it would be great for Andrew to come over to Hawaii and surf the big waves at Sunset Beach – come as a family’. So we went to Hawaii and that was when Stand-up paddling was just beginning there – you’d see the odd person out here and say ‘what is that person doing, sweeping the ocean?’ – it looked really weird. At any rate, off we went with Bruce, met all these famous surfers, and Andrew did of course surf Sunset, I have a picture of him on a wave that’s three times the height of him, which was a great thrill for him, and Charles. Stand-up paddle boarding was one of the things Bruce was into and we learnt more of it through him. We came back and Charles went off and bought a stand-up paddle board. After a year it was sitting in the garage, not being used much, so I thought maybe I should have a go at this stand-up paddle boarding, and that’s how it started. A couple of girlfriends, Lou and Lisa, were also keen to get into more paddling and more surfing so the three of us together spent a lot of time in the water learning. I can go out now surfing by myself, although I prefer to go with them, but I don’t think I could have ever got through that learning stage, where I'd just get my board and paddle out into the North Av. scene, for want of a better term, without that support. So the three of us constantly, morning after morning, taught ourselves - and we’ll still be down there now if the conditions are good. I don’t think I would have learnt to surf without their support. Has doing all this given you a sense of this growing you as a person? Oh yes – it’s more a matter of giving back for me. When I was growing up my parents were always doing stuff in the community. My auntie, my mother’s sister, was intellectually disabled, and my grandparents were founding members of Sunnyfield. One of their lifelong friends Hazel Whiddon put an advertisement in the paper saying ‘does anyone else have a disabled child and are they interested in schooling them?’. In those days my grandparents were told ‘you have two other healthy daughters, you take that daughter up to Stockton, to the hospital there, and you leave her there and you get on with your life’. Of course they didn’t do that, they went on to be people involved in the establishment of Sunnyfield. So as children we were always raising money for Sunnyfield. My father is a Life Member of the Manly Apex Club, so he too was always doing things for the community. In those days Manly Apex Club used to meet the poms arriving on the boats, to embrace them into the community. Dad was a pom, arrived when he was 21, and Apex met him, so he was ensconced in Apex and always doing stuff for the community and stuff for Sunnyfield. At the age of 12 I used to run around collecting things off my neighbours and then I’d have a Fete in my garden (laughs) to raise funds. Id raise around $50.00 and give it to Sunnyfield – I’d have this banner “Fete Here – Saturday”, I’d put posters in everybody’s letterbox saying I’d be around to collect for the White Elephant stall and then I’d expect the same people to come and buy their neighbours rubbish. My brothers were very into golfing and would set up a little golf stall where you could putt onto the two dollar note and win the $2.00 – so it’s always been in my blood I suppose to be doing for others. Avalon Beach SLSC is celebrating its 90th this year – what is the best thing about being involved with this surf club? I like the family culture at Avalon, and it’s a residents or locals club in a lot of ways, which is great - with other Pittwater clubs there can be a lot of people from out of the area. In Avalon the sense of community, whether you’re in the surf club or have kids in the primary school, is amazing anyway and this just extends to the life saving club. I like the sand dunes, that there are spots on the beach where you can’t see the houses – it’s quite rugged compared to beaches where the road runs alongside or you don’t have those dunes. The crossing of the generations too is great – you can go into the clubhouse and there will be a five year old Nipper running around beside an 85 year old Life Member. I really like that about the surf club, people don’t get past their ‘use by’ date and are always welcome there as part of the community. Some of the Life Members are such great characters – when they attend any of those big events you get them talking and you don’t say anything, you just listen – the stories are wonderful. Where did you meet Charles? At work, at Unisys. He arrived off the plane, pasty looking and English. We first met in Melbourne when I was down there – I had to fly around the country teaching Word Processing. I taught a 3 day basic Word Processing course 45 times in one year. I went off travelling after we'd dated for a couple of months, but after about a year he followed me over and we married and had the kids not long after. We're now both running our own freelance business' which keeps us pretty busy. Avalon Beach of course – probably North Avalon. The North Av car park is a great place and surfing at North Avalon would be one of my favourite things to do. Have a go. And… Give back. For me it's a natural instinct. I’m always sticking my nose in if I think somebody needs help with something, whether it’s crossing the road or getting something off the high shelf in the supermarket or whatever it is, my natural instinct is to offer to help. To me it’s nothing to give up a night a week for a couple of months so 50 kids can get their Bronze. To me it’s not a hardship, or being a do-gooder, it’s simply what I enjoy doing. With the Ducks - 2015. Picture courtesy Christine Hopton.